It seems counterintuitive. I know. I’m not telling you to handcuff your sales and marketing teams and keep them from picking up the phone or sending out a tweet or email. Far from it. What I am saying is, make sure they are first and foremost considering your customers and potential customers needs. Everything else will follow naturally after that. Be a resource for your customers. Build their trust in you. Become an expert in your field. Teach them best practices and offer tips and tricks. Do all of that and when it comes time for them to need the products or services you offer, they won’t even think twice about going with you. Your job will have already been done. No need for the sales pitch. Think about it. Look at your inbox. Those unopened emails from companies you’ve just been too lazy to unsubscribe from. The Twitter accounts you don’t follow back, because their feed is comprised of a thousand variations of the same sales pitch and nothing else. You tune them out, because they did nothing for you. That’s why you must dedicate your marketing channels to helping, rather than selling. Pin this tip from the blog post, or repin it on Pinterest, for your chance at a $25 iTunes gift card. 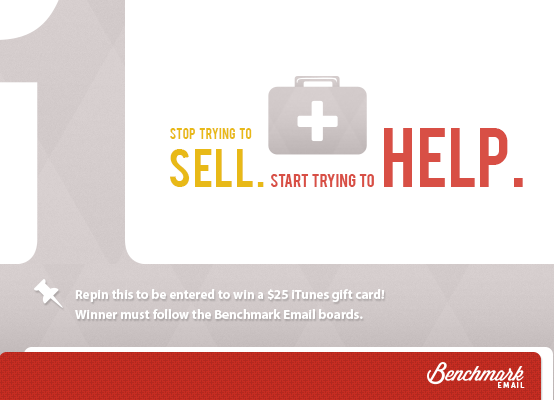 You must be following the Benchmark Email infographics board to qualify to win. Check out the full details for the Pinterest iTunes gift card giveaway. Certainly, I agree with you on the point that the blogger should try to help their readers the sale will automatically done by the readers. If you thinking about to help the readers than you will focus on solution providing to readers with their content that's not only create's your online authority but also made sale at the back end. Thanks for the kind words, Karen! And for participating in our Pinterest gift card giveaway.